The boyfriend’s Dad is from Trinidad, and I love curries. So naturally, whenever he’s cooking, I’m in the kitchen, spying and taking copious notes. This curry is one of my absolute favourites, that I learned a few years ago and have since made my own: channa (chickpea) and aloo (potato). It’s the base curry for any of the Trinidadian rotis (flatbread wraps). You could add anything you like to this curry — the omnivorous boyfriend will add shrimp, goat, beef, etc., while I love pumpkin, eggplant, or lentils! The roti skins (flatbread) that we use are dahlpuri roti, they have a ground split pea layer in between two soft & flaky layers of wheat flour flatbread. I’ve made them before, and four hours later the result was a huge mess of my kitchen. Now I tend to buy them pre-done at Caribbean grocery stores. Most roti shops that sell the whole roti-wrapped curry bundle of delight will also sell just the skins. We reheat them in the microwave by wrapping them in paper towels, and nuking for 90 seconds to 2 minutes. Heating them in the oven would also work well, and you could keep some warm as you eat. If you’re eating gluten-free, you can go with a chickpea flour pancake wrapper, or just have the curry as it is! Portable: Roll everything up in the roti skin, like a burrito, and eat with your hands. Messiest (my fave): Pile a spoon or two of curry onto your plate, and use torn pieces of the roti skin to scoop up your dinner with your right hand (also how I eat Indian food). 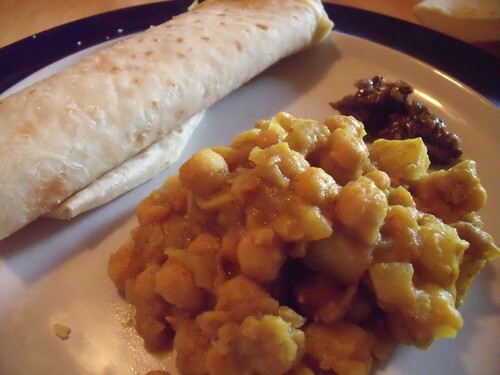 Conservative: Place a scoop of the curry into your roti skin, roll like a crepe, and eat with a knife and fork. Condiments are also very important here. My absolute favourites with roti are kuchela and scotch bonnet hot sauce. Our house brand of kuchela (unripe grated green mango pickle) is Matouk’s Mango Kuchela , and other brands are always disappointing. If you’d like to make your own, this tutorial looks pretty good (disclaimer: I haven’t tried it). This is a great dish to serve to a giant group of friends. We make it every year during our weekly cottage get-away, and enjoy leftovers the next day. Serves 8, feel free to minimize the batch or eat for a few meals. This is one of those curries that’s even better the next day. In a large thick-bottomed pot over medium-low heat, sweat olive oil, garlic and onions until translucent (about 5 minutes). Add potatoes, cover the pot with a lid, and cook until potatoes are fork-tender (about 15-20 minutes). In a glass or mug, combine curry powder & chili flakes with 1 c. water and mix well. Add the chickpeas, curry powder mixture, and extra water to the potatoes. 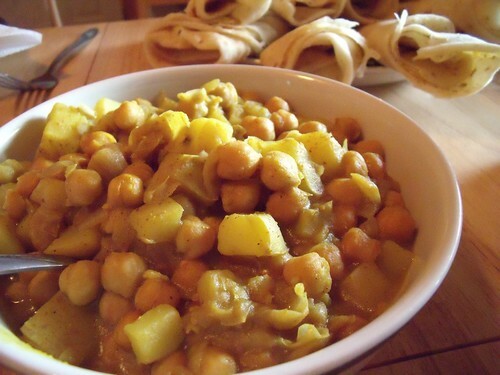 Stir well to evenly cover the potatoes and chickpeas with the curry mixture. Cook over medium heat until there is no extra liquid in the curry. You will need to stir frequently (every 5 minutes or so) to avoid burning curry on the bottom of the pot. Season with a sprinkle of salt. See blog post for full serving instructions, with or without dhalpuri roti skins. Enjoy! You are obviously an amazing and psychic friend…thanks for posting, and can’t wait to make this over the weekend!